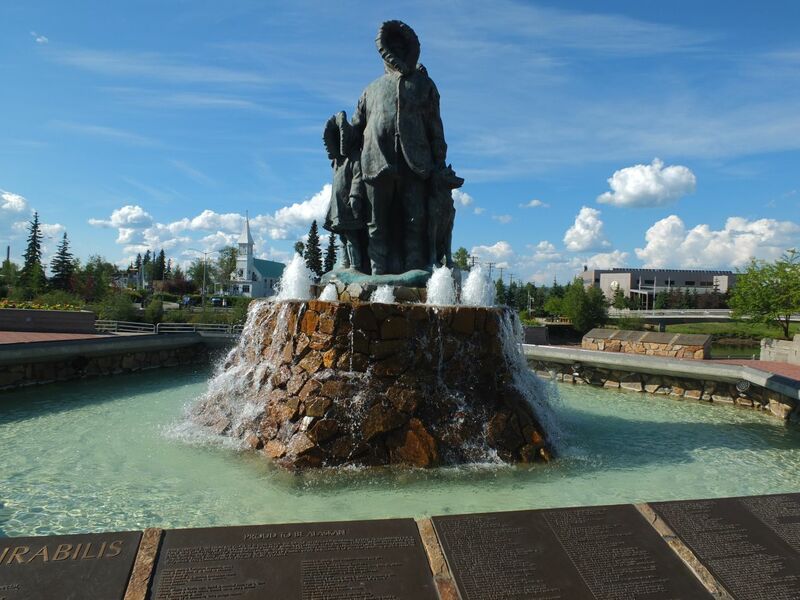 Fairbanks is the second largest city in Alaska, and the only human habitation of any size located in the interior of the state. 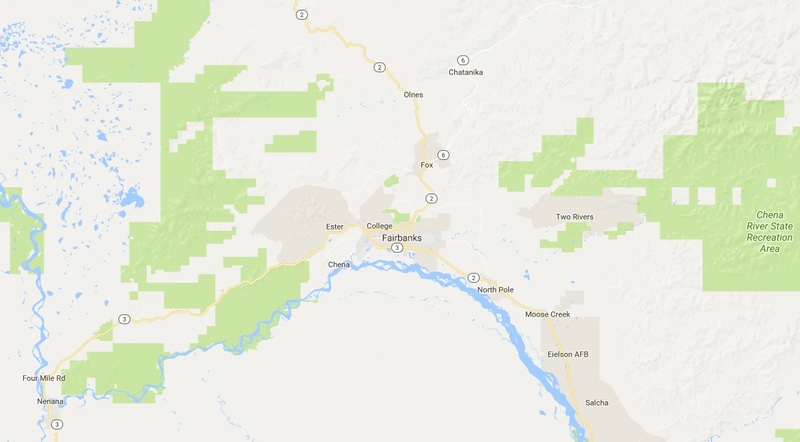 A quick Google search puts the population of Fairbanks at 32,000 and the entire surrounding region at 100,000 people, which should provide some idea of the sparseness of this area. I spent two days in Fairbanks, one heading north from Denali and the other coming south from the Arctic Circle. These two separate days are combined together here to provide an accounting my travels in and around Fairbanks. 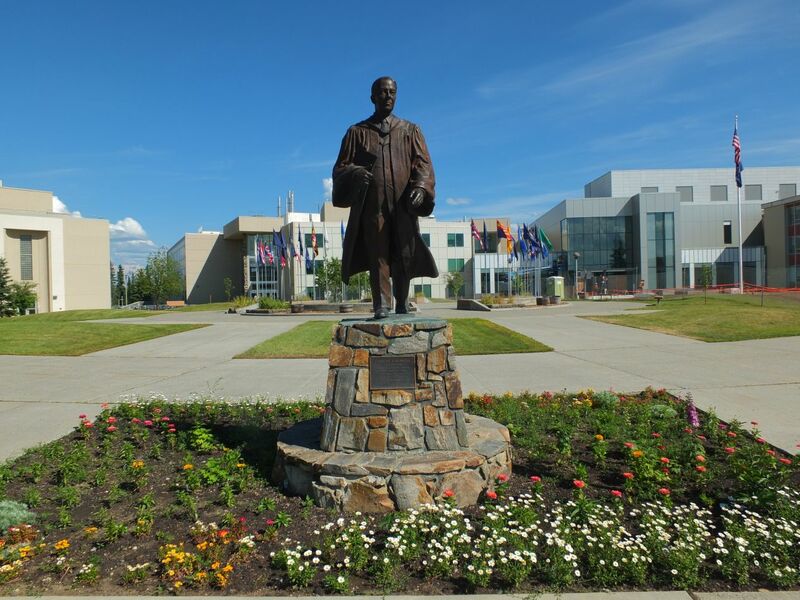 Fairbanks is probably best known for absolutely brutal winters that put Anchorage's coastal climate to shame. The area is officially classifed as subarctic with long, very cold winters and short, warm summers. 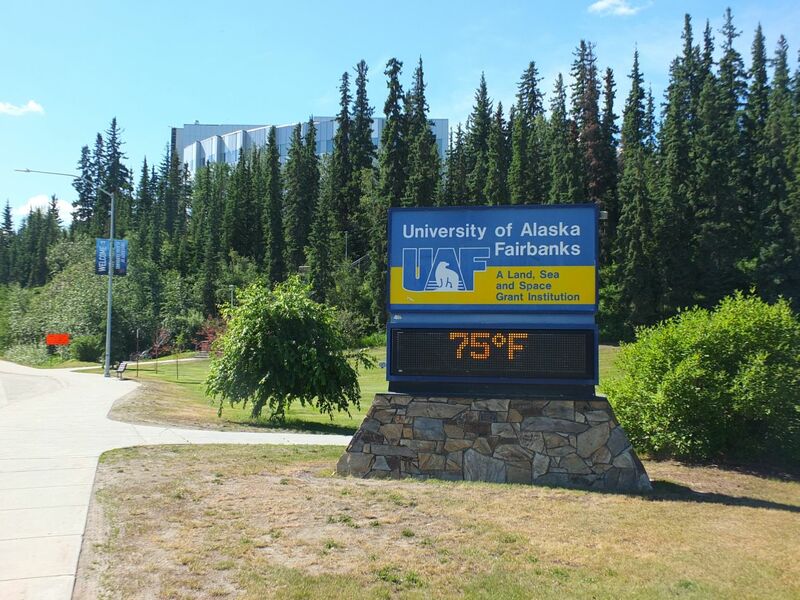 It was surpringly hot at times when I was in Fairbanks, with highs reaching close to 80 degrees Fahrenheit (a little above 25 degrees Celsius). In contrast, the daily winter lows routinely drop to -25 degrees, and periods of extreme cold can see temperatures below -50 degrees. At those temperatures, most automobiles won't operate because the gasoline inside them freezes, and even brief exposures to the cold can be deadly. Fortunately I wouldn't have to deal with any of that, and it was quite pleasant during my visit. 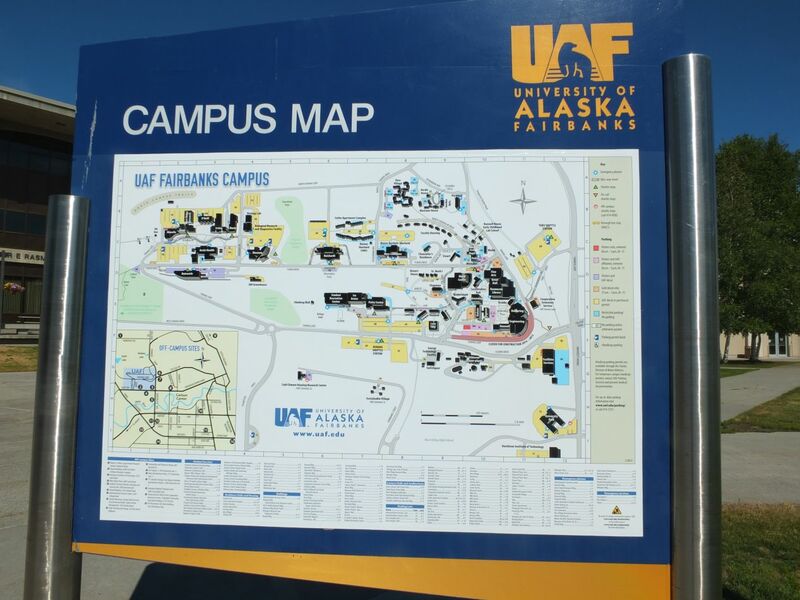 I spent some time on my arrival walking around the campus of the University of Alaska Fairbanks, which was close to where I was staying. That sign with the temperature readout in front the university is a very popular place to take pictures, and there are lots of images online of students standing in front of it (sometimes mostly unclothed) when the mercury drops to -30 or -40 degrees. Here in the summer, everything was green and had that neatly maintained look that college campuses always seem to cultivate. One of the halls on the campus is where the Alaska state constitution was drafted, which is a neat piece of history. 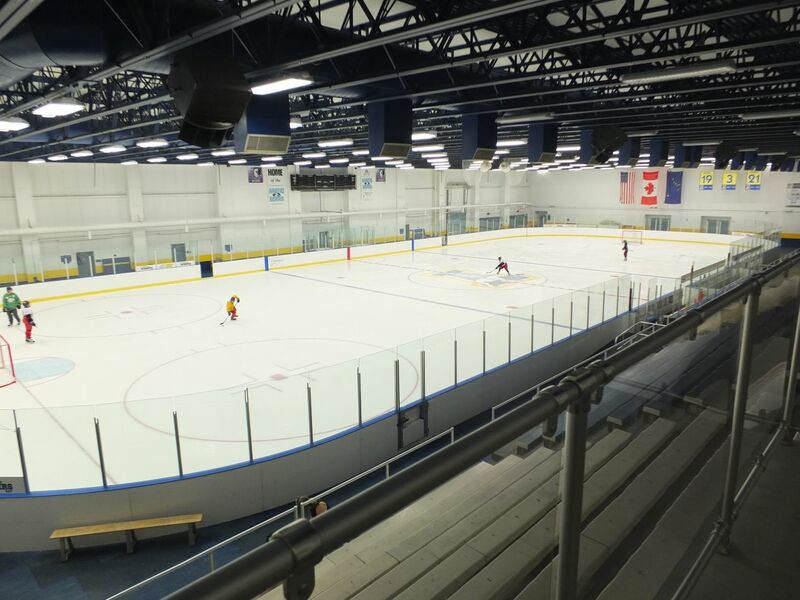 The university also touts their ice hockey team, which is of course the most popular sporting event in town, especially when they play their archrival Alaska Anchorage. When I visited in 2015, Alaska Fairbanks was touting their victory in this match from the previous year. The university also has a cool nickname for their sports teams: the Nanooks (an indigenous term for polar bears). In fairness though, Alaska Anchorage has the Seawolves as their mascot, and that's a pretty awesome name as well. 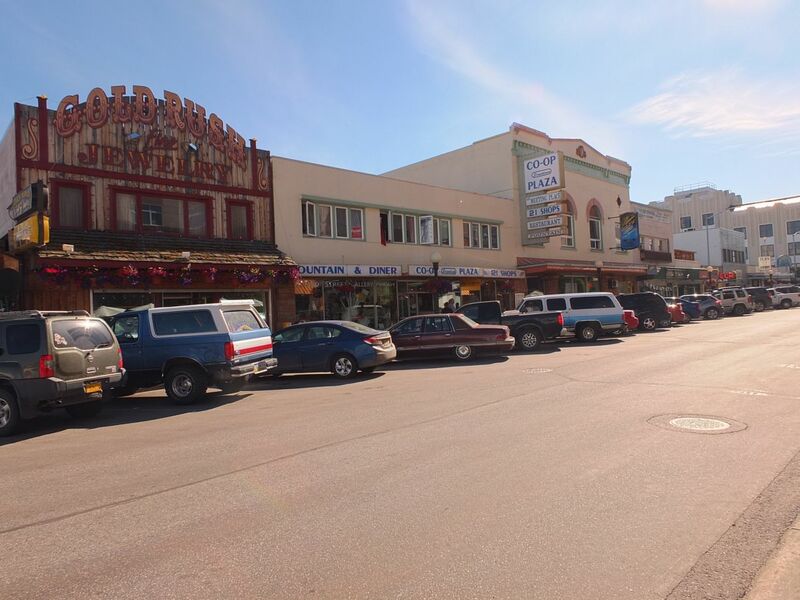 The downtown area in Fairbanks is very small, significantly smaller than in Anchorage. Like its larger cousin to the south, Fairbanks is a spread out city where it's assumed that everyone will own a car of some kind to get around. 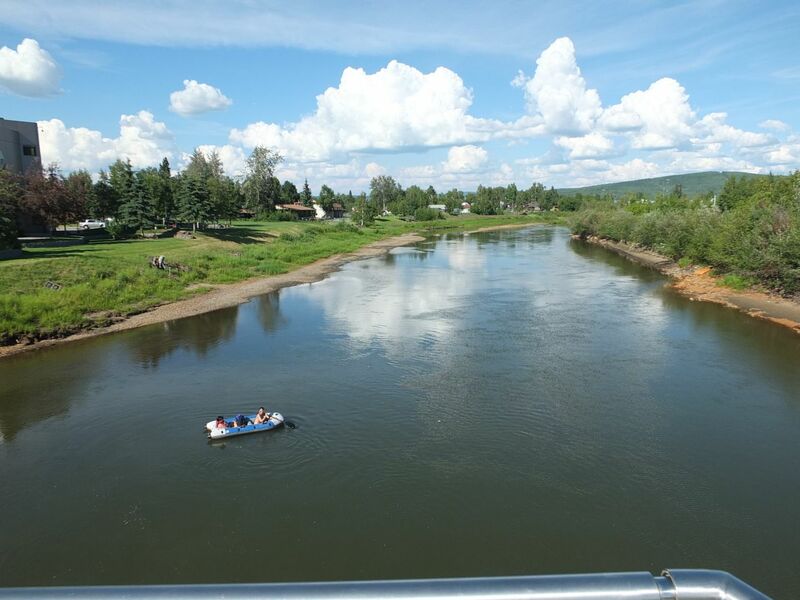 Even with its tiny size, Fairbanks is not a particularly walkable or pedestrian-friendly city. This is also not a place to come expecting public transportation. Instead, it's a town based around rugged individualism and the frontier spirit, with the idea that each person can best see to their own freedom without much in the way of interference from the public sector. 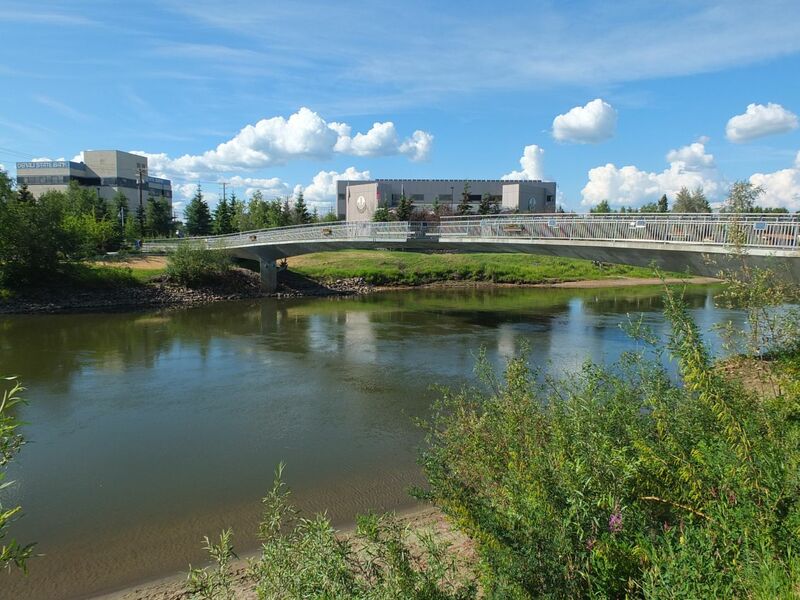 The downtown area did have a few attractive public spaces, like the pedestrian bridge over the Chena River and Golden Heart Plaza with its monument to the settlers of the region. There's also a museum nearby dedicated to dog mushing and dog sledding, appropriate for the region, and a number of small stores and restaurants. When I ate dinner at "Big Daddy's BBQ" on this evening, I was even able to watch the Orioles game because they were on national television that night. Nice! 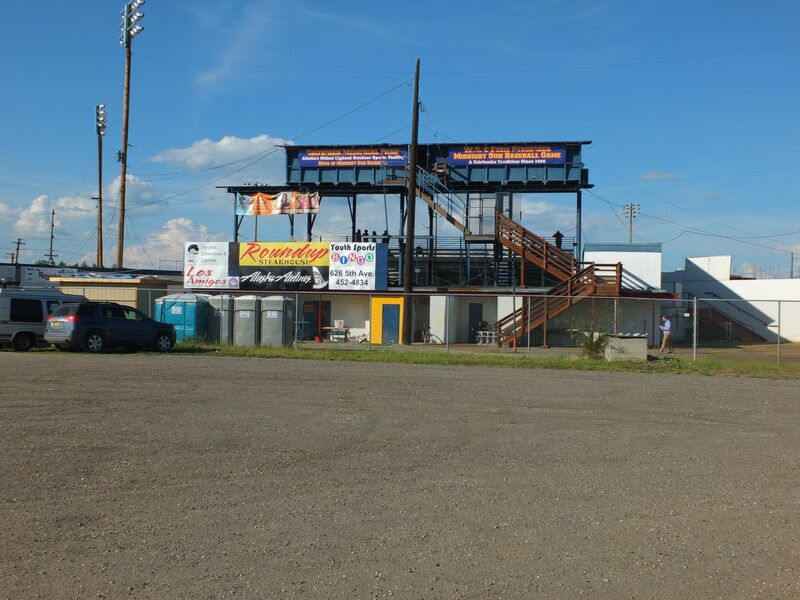 With baseball on the mind, after dinner I went to see the Alaska Goldpanners, a local semipro baseball team that plays in Fairbanks. 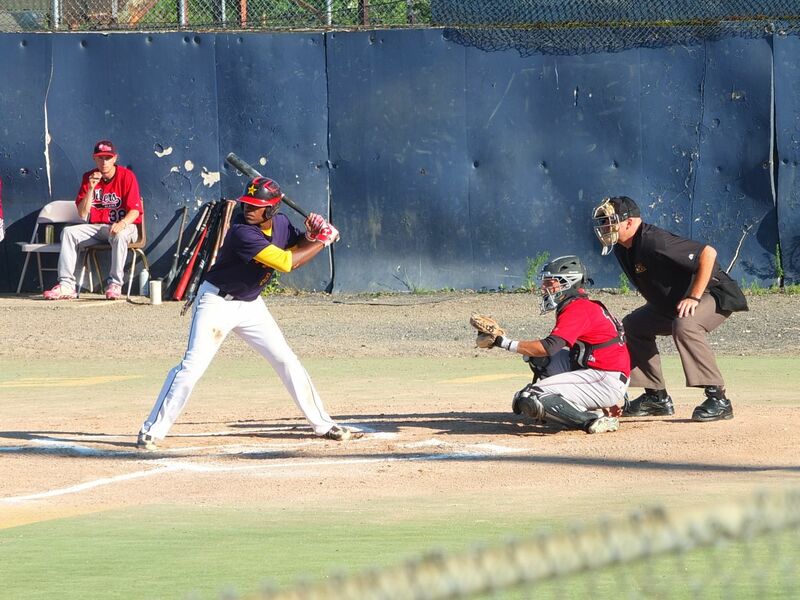 The Alaska Baseball League has been around since the 1960s, and runs during the brief summer months using amateur players typically drawn from the ranks of colleges and universities across the United States. A number of these players have gone on to have successful professional careers down the road, and the general feel is similar to watching a minor league baseball game. The Goldpanners are best known for playing a game each year under the Midnight Sun, starting at 10:00 pm and playing the whole game with no artificial lights thanks to the long days of the high northern latitude. At the time I visited Fairbanks in late June, the city was only getting 2.5 hours of darkness each night. This particular game was taking place around 8:00 in the evening, and from the angle of the sun in these pictures it looked like mid-afternoon. Admission to Growden Memorial Park for this game was extremely cheap, on the order of three or four dollars. I had the impression that the organizers of this game were just happy to have anyone show up. The facilities at the stadium were frankly underwhelming. The infield was made up of old-fashioned astroturf (not the newer field turf) and looked like it needed replacing. 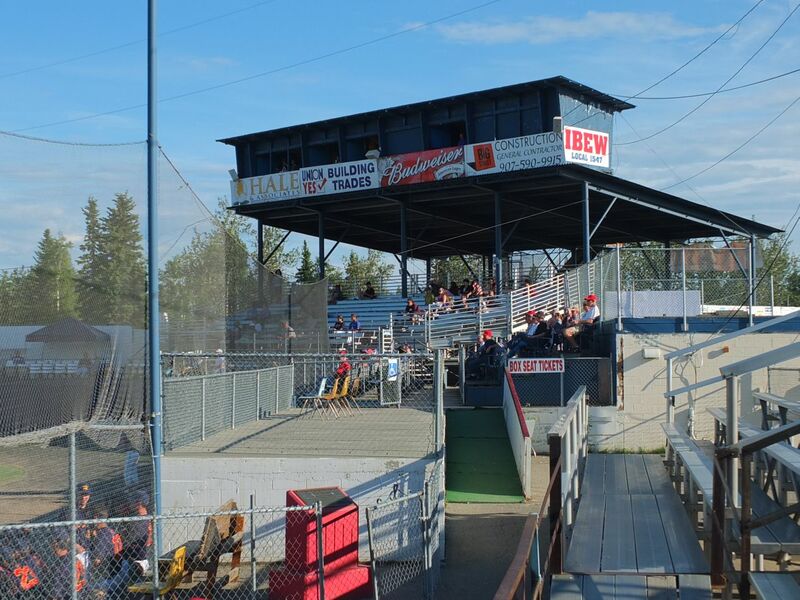 The seats were basic bleachers that looked straight out of the 1970s, and the broadcast tower was a ramshackle affair. I worried that the whole thing was going to collapse if a foul ball hit it. Unfortunately the game was also mostly deserted, with maybe two hundred people at most in attendance. 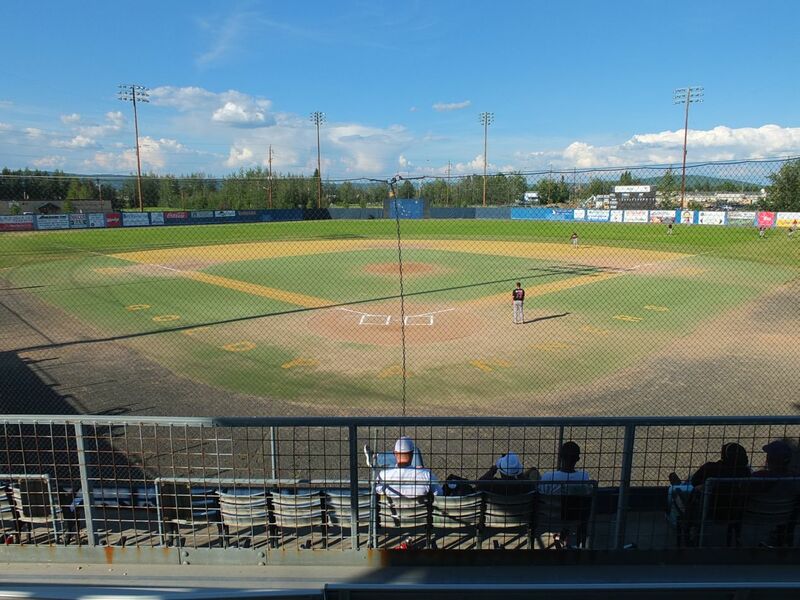 I've seen much better facilities at high schools, and I hope the Alaska Baseball League can get some more funding to fix things up a bit. This experience was a bit of a disappointment compared to what I was expecting. The baseball game was the end of that particular day of sightseeing. 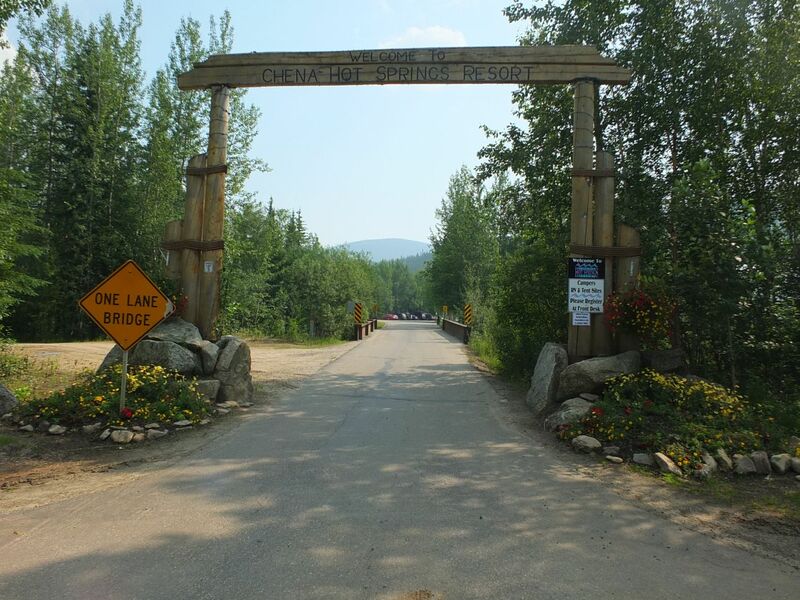 On my return to Fairbanks later that week, I had the chance to visit more attractions in the area. The first of these was the town of North Pole, located about 15 miles east of Fairbanks. 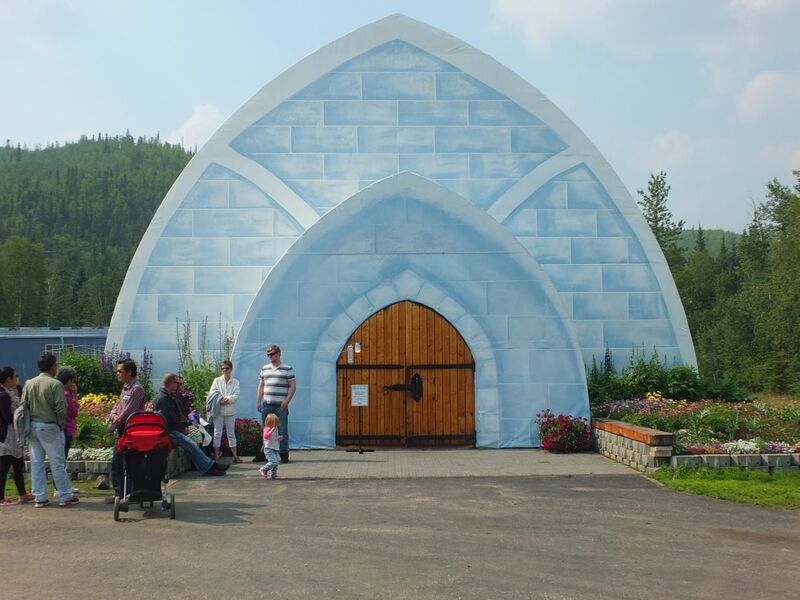 The name was likely originally intended as a reference to the frigid winters in the region, but North Pole Alaska has now become a full-on tourist trap. 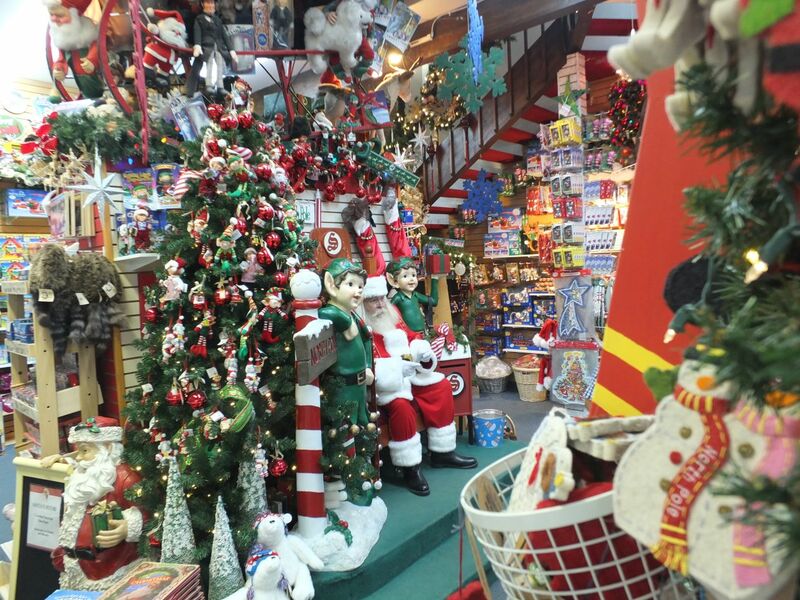 The main attraction is the Santa Claus House, a gaudy store full of every possible piece of merchandise with Christmas stamped on it in some way. 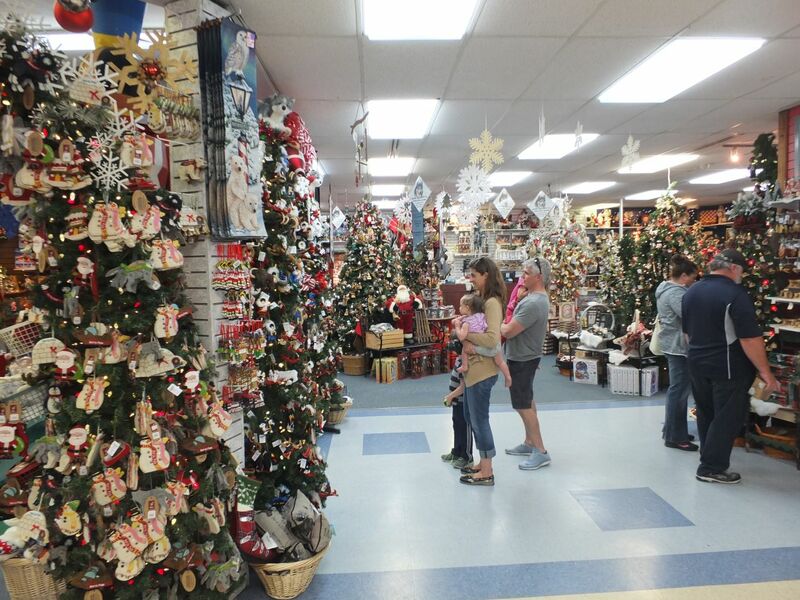 The sheer amount of tacky Christmas kitsch is overwhelming, and no one will be singling out this place for special note when the history of Western Civilization is written. 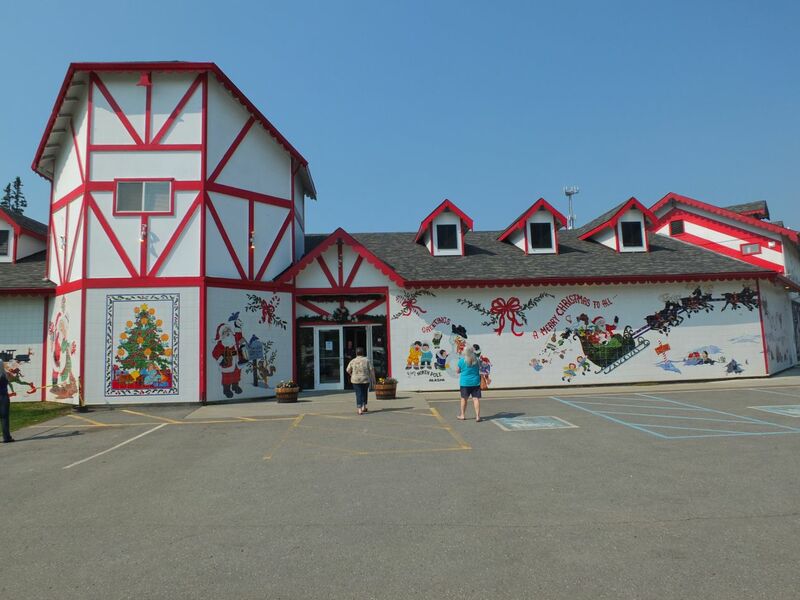 However, the Santa Claus House is still memorable and probably worth a visit just to see the worst travesties that can be birthed by holiday commercialism run amuck. I was able to get a Christmas tree ornament here for my niece (who wasn't even born at the time) and give her a gift from the "North Pole" for her first Christmas, which made it worth the visit. 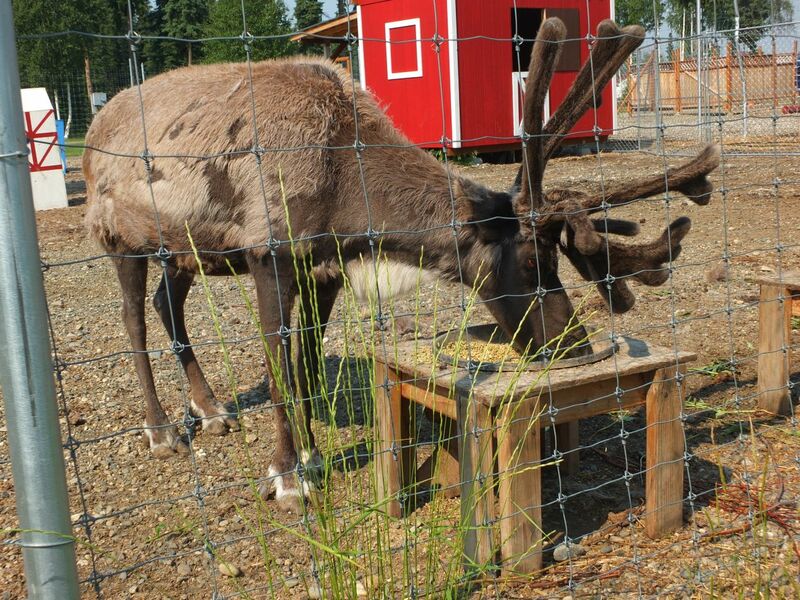 Naturally the Santa Claus House has reindeer as well, the same animals that I had seen out in the wild at Denali a few days earlier. This was my favorite part of North Pole, with the reindeer in an open area where the many families passing through could show them off to their children. The staff on hand were patient and graceful in answering questions about the animals, although I should mention that this wasn't a petting zoo and touching the animals was off limits. Up close, the fur on these reindeer was patchy and rubbing off, as their winter coats gave way to their thinner summer hair. 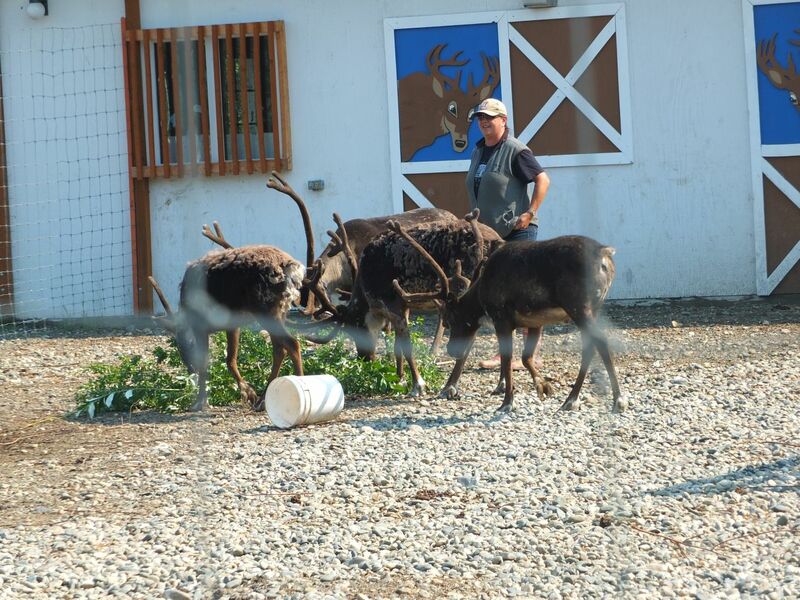 It's also not until seeing these creatures in person that one realizes the size of their antlers; the staff explained that their antlers can grow as much as six inches in one day, and that they can visibly see the growth on a day by day basis. Amazing animals. Also amazing: did you know that Blockbuster Video is still in business in Alaska?! Or at least they were in 2015 anyway. 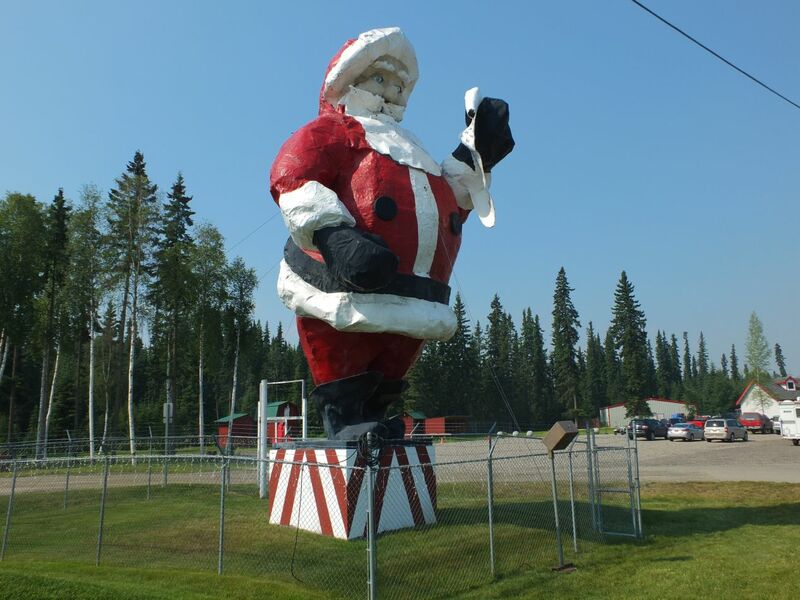 I saw three of them just around Fairbanks, including one in North Pole near the Santa Claus House. Long disappeared in the rest of the country, the video rental business is apparently alive and well in Alaska, which I guess makes sense due to the difficulty of getting high speed Internet access in many rural areas for video streaming services. This was arguably the single strangest thing about my visit to Alaska. 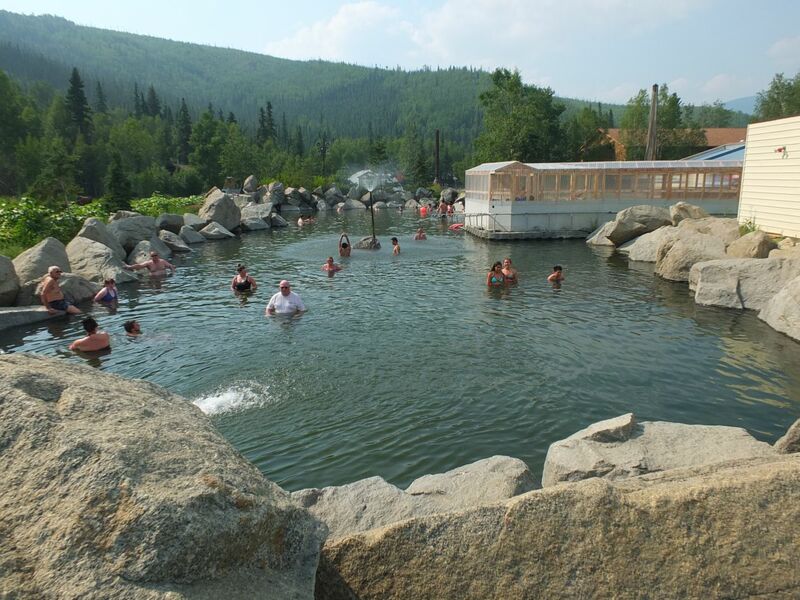 Chena Hot Springs Resort also has something that they call the Aurora Ice Museum. 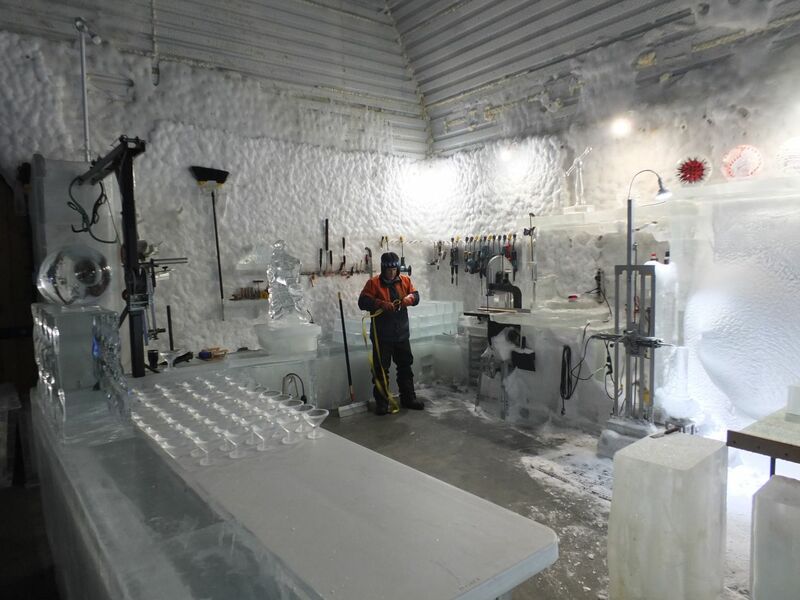 It's essentially a huge enclosed refrigerator where ice carving takes place year round. 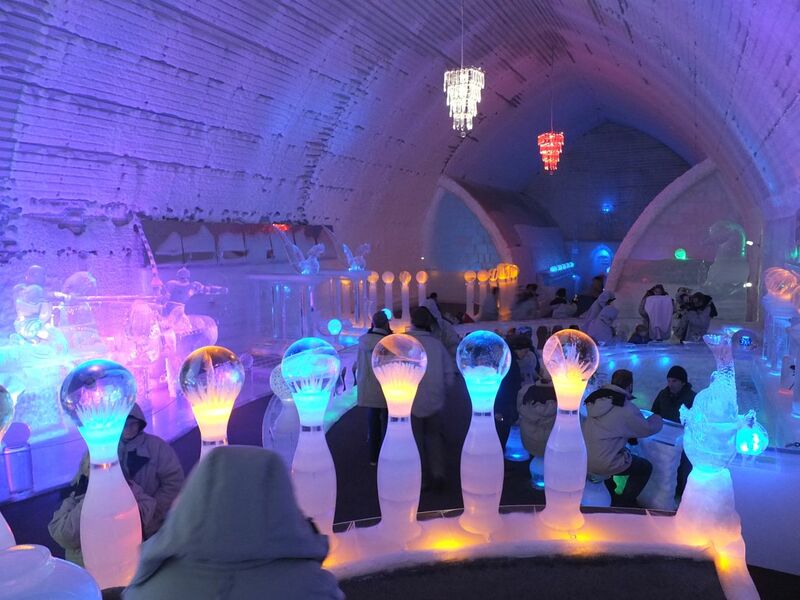 I had been to Sweden's Ice Hotel a number of years earlier in Jukkasjärvi, and this was certainly no comparison to that incredible feat of construction. Still, for the middle of summer, it was neat to check this out and see what some of the local artists had managed to craft in the way of ice sculptures. Entrance to the ice museum is controlled through group tours, and everyone who enters the building is tasked with putting on heavy jackets for warmth. There's a good reason for this: it was COLD inside, obviously, in order to keep the ice from melting. I soon found myself wishing that the tour provided gloves as well as a coat. 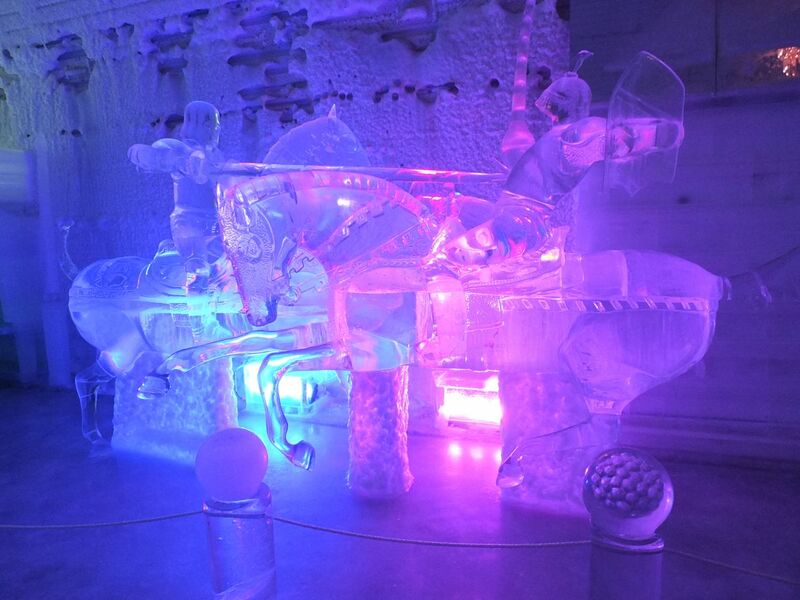 The immediate entrance contained the ice carving station with all of the various tools of the trade. The artist on staff had been producing a series of ice glasses (visible on the left in one of the pictures above) used to serve cocktails to those who were willing to purchase them. 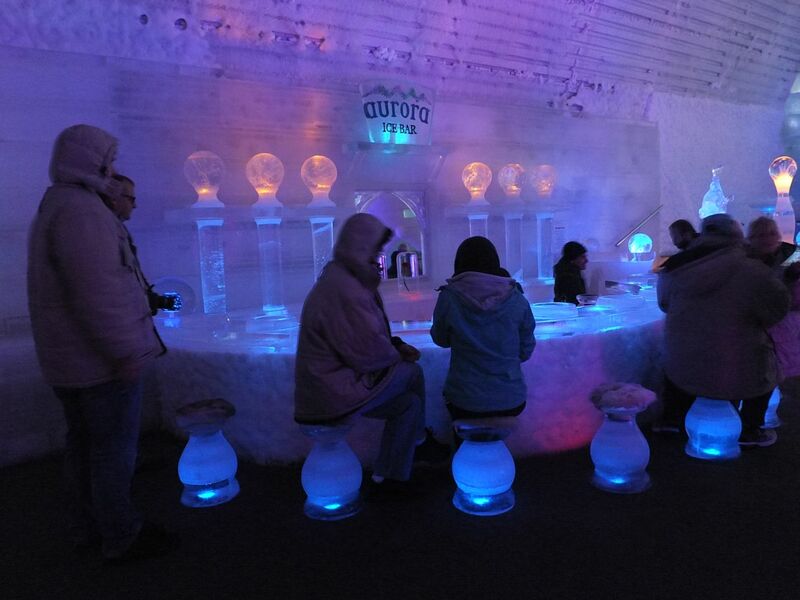 Yes, the Aurora Ice Museum had a functioning bar inside, although it was no patch on the bar in the Ice Hotel since there was only one drink served here. 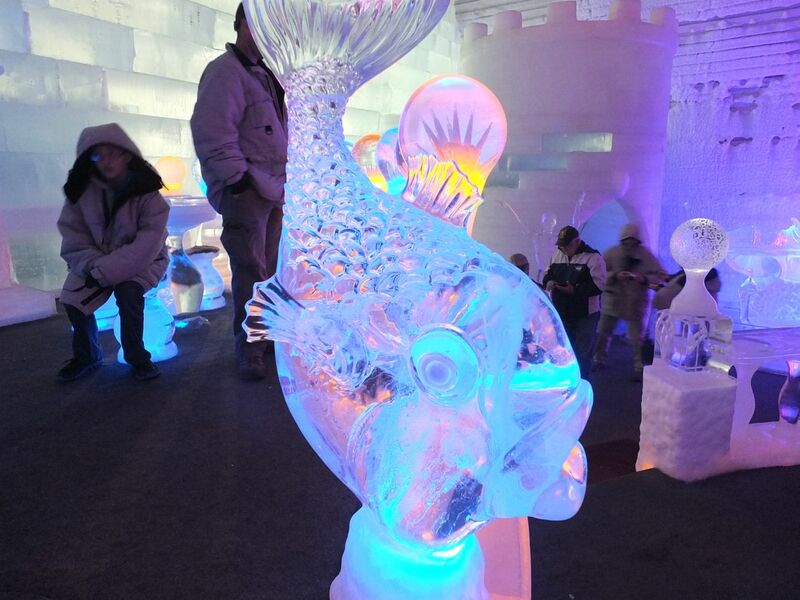 As far as the ice sculptures went, I thought the most impressive was a pair of two knights jousting one another, created at life size and with fine attention to detail. There was also a fish sculpture with fine detail on the individual scales. The natural impulse is to reach out and touch these ice carvings, which the staff very firmly explained was out of bounds. The warmth in human skin would quickly melt the ice if people kept touching them. (Note: this is another reason why they should have provided gloves!) Everything inside was lit with strange pastel colors, orange and light blue and pink. This was done to try and mimic the color of the auroras that appear so frequently in the Fairbanks area, although from my one time seeing the Northern Lights I know that those colors are rare. Green is by far the most common color for the auroras. Anyway, this was a memorable experience and worth the drive to check out. I managed to squeeze in one more stop before the end of the day, visiting the Fountainhead Antique Auto Museum back in Fairbanks proper. This place is tucked away back near an apartment complex, and it's easy to miss unless the visitor knows about it ahead of time. I managed to get here about 45 minutes before closing, and the staff was kind enough to give me a half price admission without my even asking for it. The place was mostly deserted inside, and I had the pleasure of getting to explore almost completely to myself. 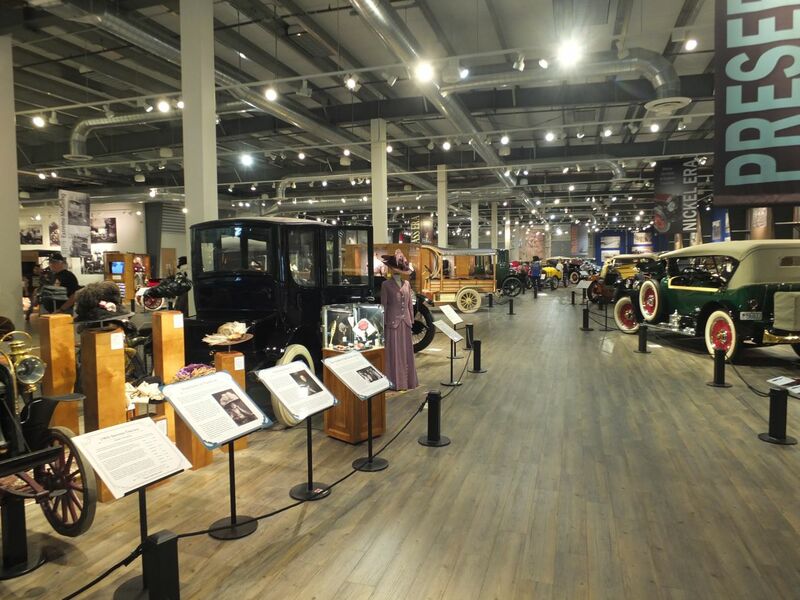 As the name suggests, this museum houses dozens and dozens of antique cars, all dating from the 1930s or earlier. What all of these are doing up in Alaska is beyond me. The collection was very impressive though, and I'm not a car enthusiast in the least. For someone who is an actual gearhead, this place would be a must-see stop. Not only are these antique cars on full display, they're all kept road-drivable as well. There was a video of someone on staff driving an 1898 Hay Motor Vehicle in the parking lot, one of the earliest cars made in America, and it was running just fine. That thing was basically a carriage seat on top of four bicycle wheels and with a gasoline engine strapped on the back, and it was one of the funniest vehicles I've ever seen. Like a riding lawnmower created in the Victorian era, heh. 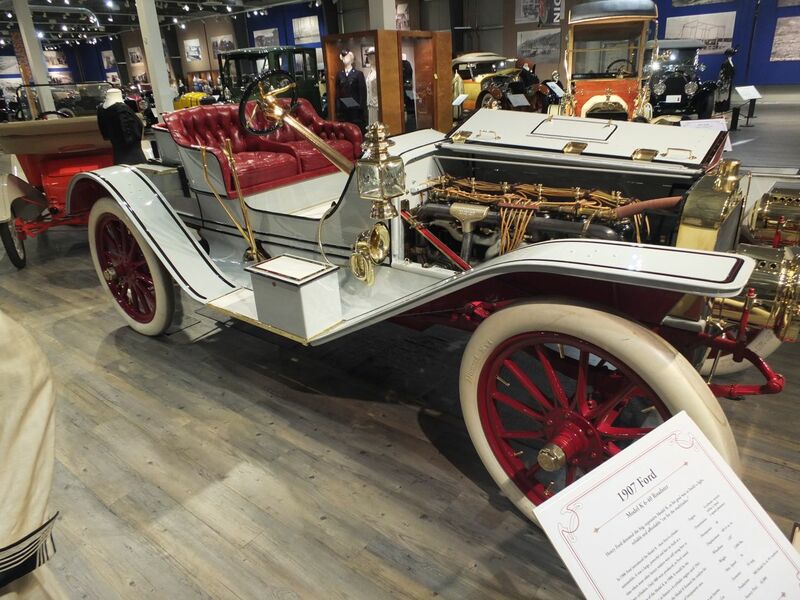 Other cars weren't quite as old but were a lot more stylish; most of the antique vehicles on displays were luxury products intended for the wealthy to play around with, since there was no way someone from the working class could afford a car in, say, 1905. 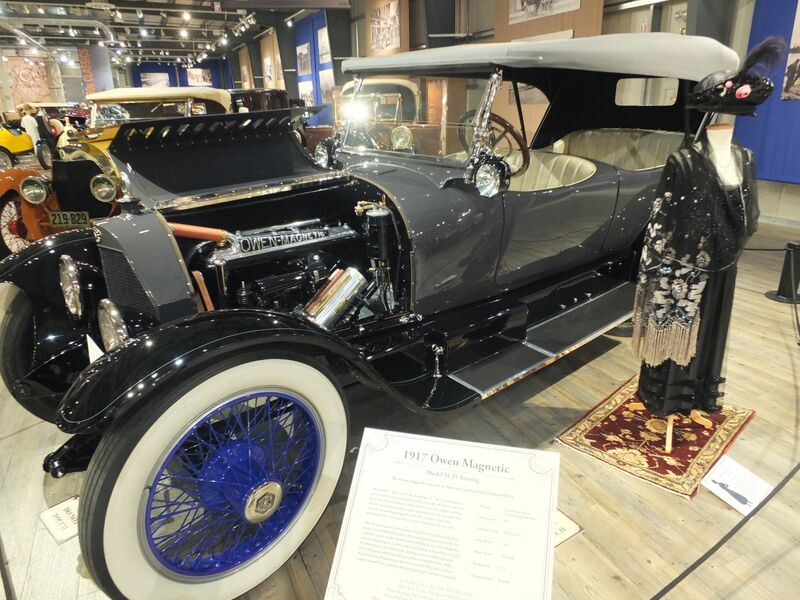 Many of these old cars are beautiful creations; I particularly liked this gold and ivory colored 1907 Ford Model K 6-40 Roadster, and the gray colored 1917 Owen Magnetic Model M-25 with electric blue paint on the wheels. These might have been the playthings of the rich, but they were (and are) some fine works of engineering. 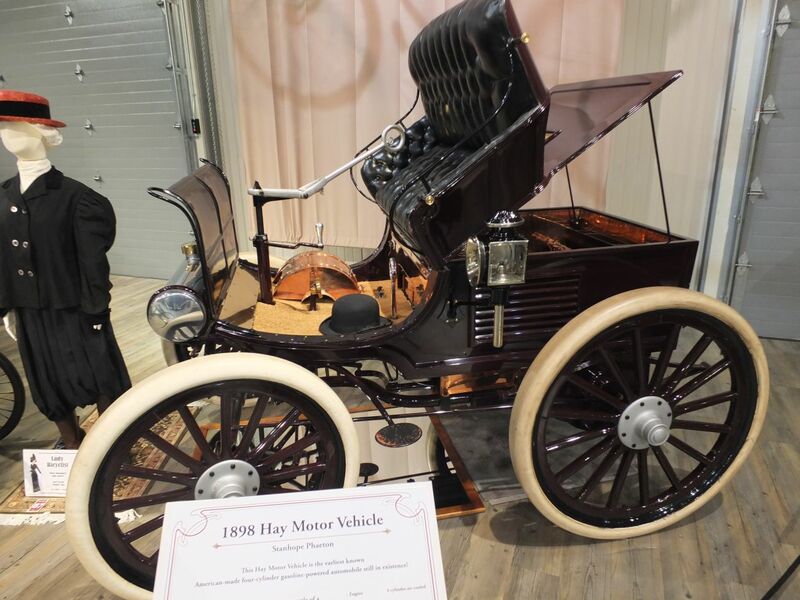 A lot of the early cars also have strange features, like steering wheels placed with no consistency on either side of the car, one vehicle that had a brake pedal for both the driver and passenger in the front seat, and one car where the passengers in the front seat faced backwards, and the driver sat in the rear seat looking forward, much like the passenger area in a horse-drawn carriage. In fact, it becomes clear when walking through a museum like this that almost all of the early designs were based on horse-drawn carriages, with the engine simply replacing the animals. It would take a few decades of automotive engineering to shift designs towards the more modern standards that we enjoy now. I imagine we'll see something similar with self-driving cars once the technology matures in the future. That was all for Fairbanks, and I was pleased with what I managed to see in the less than two days that I visited. The last destination for this trip lay even further north, heading up the Dalton Highway past the Arctic Circle and into the tundra, in the hopes of reaching the Arctic Ocean itself.